When you hear about the word sweets, one expects loads of sugar and fatty foods. Who ever said that sweets cannot be nutritious and healthy? The gum exudes naturally from the roots of the plant and from incisions made in the stem. This is collected and when dried forms crystals of flakes or may be formed into blocks. It is also known as gondkatira, or Tragacanth gum. It is a coolant and at the same time is rich in soluble fiber. It is easily available in where grains and dry fruits are available. BENEFITS: Dates are rich source of iron, ginger powder is anti-inflammatory and almonds are rich source of omega 3 fats, gum is good for bones. Once the hard ball consistency is achieved, add the roasted sesame seeds/ unsalted peanuts to the jaggery syrup. Mix well. It will harden when it cools down and you can make small pieces of it. P.S. 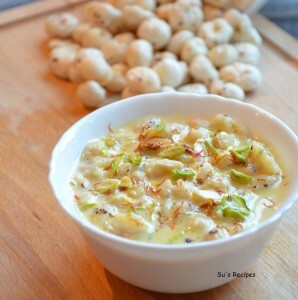 :- You can use almonds/ walnuts/ dalia (Roasted unsalted gram dal)/ rajgeera (Amaranth seeds) etc. 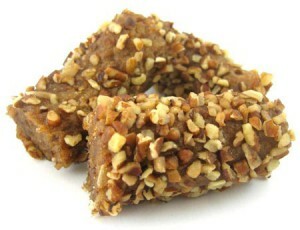 BENEFITS: Jaggery a rich source of iron and til/sesame seed is super source of Calcium. 2 spoonfuls of sesame seeds equals calcium equal to 1 glass of milk. 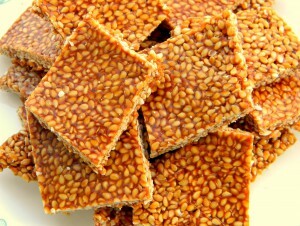 Jaggery- til/ sesame seed chikki is best for women during their menses. 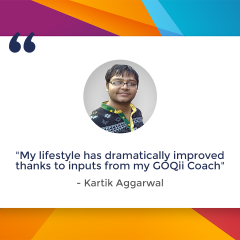 It eases the menstrual pain. Add cardamom powder, pinch of saffron, almond slivers to the above mixture. Add jaggery and stir well. PS:- You can replace Foxnuts with brown rice/ grated carrot/ grated bottlegourd/ Haleem seeds/ Ragi/too. BENEFITS:Foxnut is rich source of calcium, high in fiber, antioxidant and proteins which when had along with milk increases its nutritional value further. Almonds again is a rich source of omega 3 and fiber. It serves as the best food for toddlers and infants in their growing age. Even for pregnant and lactating females. 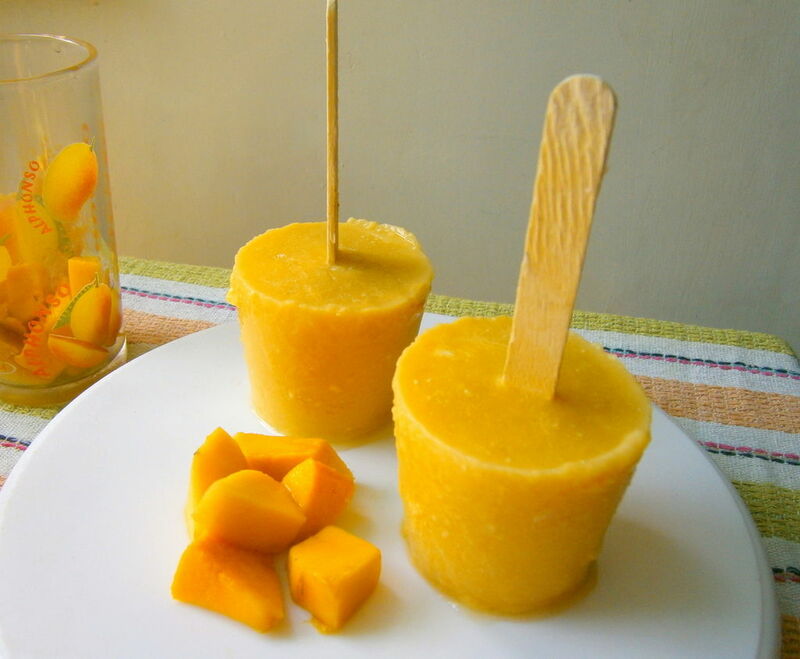 In a blender, mix well the low fat fresh yoghurt and the ripe mango puree. 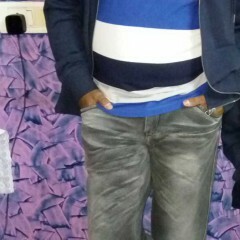 Do not add any sugar since fruit has its natural sweetness. If need be, add stevia leaves. Heat a tablespoon of ghee in a wide pan on medium heat; stir in the broken wheat and roast the wheat until it gets a roasted aroma and the color changes to golden orange. In another pan, dissolve the jaggery in 2 cups warm water. Strain if you see any impurities/residue. 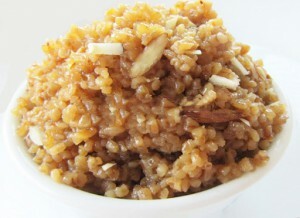 Pour in the jaggery mixture and cardamom powder in the broken wheat mixture stirring continuously until well combined. Reduce the heat to low and cover the pan with a lid and simmer for 10-15 minutes; stirring occasionally until the wheat is cooked to tender. BENEFITS: Broken wheat is rich in fiber and manganese, magnesium, phosphorus. It contains all the nutrients present in whole wheat. When had with jiggery, it serves to be a nutrient dense sweet. Cook the lentil with 1-1/2 cups of water until soft and is well cooked. You can even pressure cook the lentil for one whistle and simmer on slow flame for a few minutes more. Drain any excess water from the lentil and keep aside. Heat ghee in another pan on medium heat, add the jaggery and stir until the jiggery dissolves completely. Stir in the cooked lentils, saffron, cardamom and nutmeg to the jaggery mixture until well combined. Continue stirring the mixture until the lentil mixture begins to thicken and leaves the sides of the pan. Turn off the flame and let the mixture cool completely. Divide the dough and Puran mixture into 6-7 equal portions. Roll out rotis with the help of dry wheat flour. Place the puran mixture into the center, bring all the edges of the rolled roti towards the center and fold over to cover the filling, thereby sealing the puran mixture completely. Flatten the stuffed dough; dust over a little flour and roll gently into medium sized rotis/ circle ensuring not to put too much pressure as the puran can come out of the dough. Preheat an iron skillet on medium high; place the rolled puranpoli’s onto the skillet to cook until golden brown on both sides by applying minimal of ghee over it to give it a crispier texture. BENEFITS: Excellent cereal pulse combination providing good quality proteins. Iron from jiggery. Good satiety value since high in proteins, fiber. Blend the finely chopped dates and figs with 1-2 tablespoon of milk until smooth. In a nonstick pan, sauté the blend paste until golden brown. Keep stirring continuously till the mixture leaves sides of the pan. In this mixture, add the roasted dry fruits and mix well. BENEFITS: Serves as an excellent nutrition bar. High in omega 3, iron, calcium, fiber , multivitamins and minerals. Great option for all. 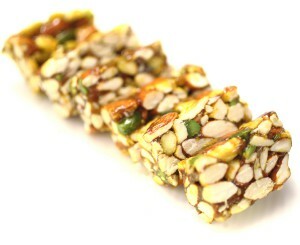 Awesome healthy nutritious sweets for the sweet lovers….